Please join us at Parade, for a great Hospitality. 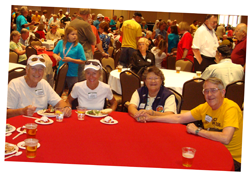 We will have room for you to meet new and old friends during the weeklong event. Wrapping around the room will be your favorite vendors and a cool drink in the center. You will find the Internet Café in Hospitality. Bring your laptop or use one of the computers available for checking e-mails and accessing the web. We will have 4 x 6 photo paper so you can print a favorite Parade photo or two to share with friends, along with a plain copy printer. Plan on joining us after the day’s events for a cool drink, a snack, check event scores, post a reminder or find an extra dinner ticket. Remember, Hospitality is where you find it all. See you in June!